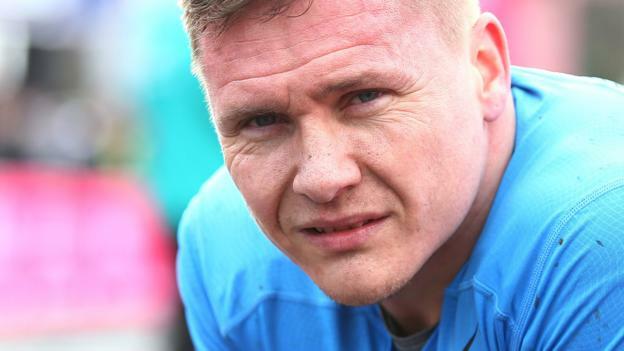 Britain’s six-time Paralympic champion David Weir says he has been through “the toughest journey” of his career, after announcing he wants to race in the marathon at the 2020 Tokyo Games. Weir, 39, won four golds at London 2012 but said he would “never wear the GB vest again” after claiming he was accused of throwing a race at Rio 2016. That led to a period when the father-of-four “wanted to jack life in”. Weir, who said the initial sessions with a counsellor “left me on the floor crying”, told BBC Sport that the process confronted his “suffering with depression”, which stemmed from not being able to “deal with my disability as a youngster”. The Londoner, who gave up track events last year, said he felt “belittled” by comments from a coach after GB failed to qualify for a relay final at Rio 2016, and looking back realises that not coping with failure in Rio and missing the birth of his fourth child were all contributory factors to what he calls “the worst experience you could ever have as an athlete”. “When people accuse you of not trying when you’ve won 28 medals for your country, it’s the worst feeling. It took me a long time to get over,” he said. His unhappy experience in Brazil did, however, prove a seminal moment for the racer known as the ‘Weir-wolf’. It forced the eight-time London Marathon winner to confront mental health problems that he says have affected him since childhood, and which were made worse by the pressure to replicate his London 2012 success in Rio. In the meantime, Weir’s personal life has also suffered and last year he split from his partner moved out of the family home he shared with his four children, something he describes as the “toughest decision of my life”. “At the beginning of 2017, my coach, Jenny, and friends could see I was struggling,” he said. “I found [a counsellor] who wasn’t involved in sport and didn’t know me and during the first conversation I was on the floor in bits, crying. “She brought up all my childhood and I didn’t realise how bad it was. It took a long time, to keep going back in every week, sometimes twice a week, to try and get over it. My personal life as well, splitting up with my kids’ mum. That was a tough decision, but all these things were going on in my mind. “I didn’t know if I was ever go to race again, didn’t know where my income was coming form. I didn’t know what to do, to be honest. It was a whole blur. Weir says it also forced him to confront the anger he had long held about being disabled. “I remember crying at night for years, asking the question: why me? My brothers were boxers, my friends were playing football. I had every component to nearly walk or stand as a kid, but I can’t walk. Why? These are the questions I used to ask. I have feeling but I can’t run around. It drove me mad for years. Before he sought help, Weir says he had suicidal thoughts. “I wanted to jack life in to be honest,” he said. “I had had enough of everything. I’d never have done it because of my children. But there were some dark says when I didn’t want to be here, to be honest. Speaking about his split from his family, he added: “I felt like the rotten apple in the family and I made the decision to move out in the new year. It was the toughest decision I’ve ever had to make in my life. Three young kids, a new-born pretty much, but I didn’t feel like I could deliver for the family. They were better off without me. “It’s tough not seeing my kids every day. How are they going to react when daddy isn’t around? Are they going to be OK at school? They have been all right, to be honest, they see me a lot and they have a great mother. After a dark period in his life, Weir is now looking forward to Tokyo – “if selected”, he adds. But rather than trying to combine track and road races, he says he will stick to the marathon, which he says “doesn’t provide the same pressure”. Having won London again in April and the Great North Run last Sunday, he will race in Berlin on Sunday before further races in Chicago and New York. And he wants to stay strong for his Weir Archer Academy, set up with his coach Jenny Archer, which is helping to train and develop 24 wheelchair athletes. “I feel like the old Dave again,” he said. “I want to be positive not just for myself, but for my academy. I don’t want them to see this negative person who was in Rio and afterwards, being bitter and moody and horrible. “They are looking up to me. I have to prove a point. I can turn things around. I just want to be a voice for people who are in that dark hole. They can climb back out and be positive and do well in themselves. When people get depression you think, you’re all right, but once you get it yourself you realise how deep that hole can get. “I said I’d never wear the vest again. I’m going back on my word, but if I can still deliver and win a medal like I think I can, then why not? Previous articleDonald Trump used a noticeably out-of-date photo to commemorate 9/11. Ugh.